Daily yoga classes and a Kitesurfing course catered to your needs in really small groups for an unforgettable experience. Our packages include accommodation in a unique location right by the beach, breakfast, transfers from the airport and more! Daily yoga classes during your stay. Different levels of hatha, vinyasa and restorative Yoga. Accommodation (private or shared) at the beach front, right by the beach. 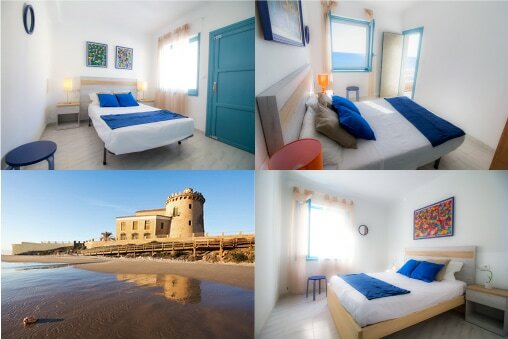 The accommodation is RIGHT on the beach, ocean views in Torre De La Horadada. The house has 4 bedrooms and 2 bathrooms (shared or private accommodation offered). It has a massive terrace right over the ocean and private access to the beach. 2 bedrooms are facing the ocean and 2 of them have balconies. We also have Wi-Fi and a large living room and a kitchen. Torre De La Horadada, is a tranquil Coastal village, situated on the border of Alicante and Murcia. See real Spain and enjoy the towns of Pilar de la Horadada and San Pedro del Pinatar, which are a few minutes away. For culture, we are also a short drive to the cities of Murcia,Cartagena and Alicante. Or if its relaxation you want we have the many Beaches just a few yards away. Filled with local and international restaurants with different options of fresh healthy cuisine. With great weather, a chain of unspoilt blue flag beaches, a Marina, little bars and restaurants, it makes a great, place to visit. Alicante Airport is a 40 min drive away, and Murcia Airport is 10/15 mins drive. Learn kiteboarding in the first certified and most professional school in the area. In addition to its great advantages in installations for maximum comfort in your favorite sport. THE STUDIO - We are an inspiring, supportive community, promoting wellness of mind, body and health through natural healing and fitness. Our beautiful yoga studio is located close to the beach in Torre de La Horadada. We have classes 5 days a week in the morning and late afternoons for beginners to advance practitioners, Vinyasa, Astanga and Hatha classes.. Our studio is fully equipped with mats, blocks, straps and bolsters and has a modern, spacious airy feel. There are changing rooms, a chill out area with complementary spring water and bathrooms on sight. The studio is In walking distance to the accommodation. Class Schedule : you can take as many classes as you like from the schedule.